ARCHIVE. Killing over 230,000 people in fourteen countries, the 2004 Indian Ocean tsunami was one of the deadliest natural disasters in recorded history. Dr. Bernardine Dias, Associate Research Professor of Robotics at Carnegie Mellon University, was a witness to the devastation, which impacted her both personally and professionally. Her work in the field of robotics from that point forward was in part dedicated to how technology can enhance disaster response. For more than a decade, Dr. Dias has been working on a robot team coordination approach based on a trading system, in which the tasks robots perform and resources they consume are the commodities traded as defined by a virtual currency common to all the robots. The robots are the traders involved in auctions to decide who will do each task. The system encourages the robots to act in a self-interested manner, i.e. to increase their wealth so that the team performs efficiently. In recent years, her research team’s work has evolved into coordinating teams of humans, robots, and software agents, like mobile phones, to execute a variety of tasks in response to a disaster scenario where things are constantly changing. The work that Dr. Dias and her team of researchers—three research engineers and a research programmer based at CMU-Q, and Dr. Anthony Stentz, a research professor at the Robotics Institute, Carnegie Mellon University, Pittsburgh, along with two research engineers there—explored three topics. The first topic involved coordinating large teams working in dynamic situations, like disasters wherein conditions are always changing due to collapsing buildings, rising water levels, fires, and road closures. In these scenarios, the focus was on coordinating the team efficiently, avoiding wasted time as the plan changed constantly in response to the dynamic situation. The second topic was aimed at creating optimal plans for smaller subsets of the team to monitor their performance in a more controlled environment. 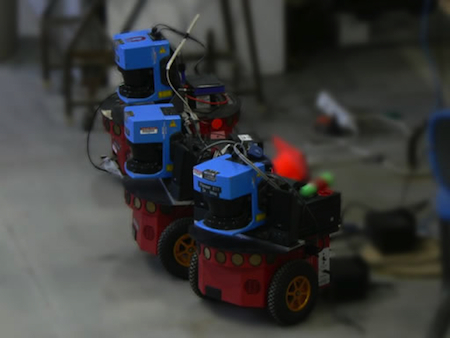 The third topic involved enabling humans and robots to effectively work together on a team. When asked if it’s difficult to train robots, Dr. Dias said it’s probably equally difficult to train humans since many people are new to the idea of robotics. Her team monitors people who have never interacted with robots before as they learn to “play on a team” with them. The results from this study have advanced the understanding in the field of robotics and in human-robot interaction. Through studying the first topic—coordinating large teams in changing, disaster-like situations—the researchers learned that the solution quality was improved by seeding the trading system with a pre-planned solution using their mathematical model. This model was created for the second topic of research involving optimal plans for smaller teams operating in settings where things are not changing as rapidly. Combining the two solutions (the trading system and the mathematical model), Dr. Dias' team developed what’s called a "seeded trading approach," to assign tasks within the team, where some of the tasks were known ahead of time and others were discovered during the disaster response mission. This allowed for a solution that proved useful in both disaster preparedness and disaster response. Once the pre-planning was complete, the team participated in the trading system, called 'TraderBots,' which assigned additional tasks arriving in real-time, Dr. Dias explained. The team tested the seeded approach in simulation and on real robots, and compared the results to an approach that was not based on pre-planning but instead involved trading all tasks including those that were known about ahead of time, in real-time once the experiment began. For the second topic, the mathematical component of this work, the research team built on and characterized the "branch-and-price" solution process for teams that have schedules where there are constraints between tasks and where delays are penalized. Their analysis revealed key insights into the difficulty of these problems: "As far as we know," Dr. Dias said, "this is the first time anyone has explored and analyzed the impact of cross-schedule dependencies on such a solution to task assignment, scheduling and routing problems. What we have discovered along these lines paves the way for future work in this direction." Along the lines of the third study topic, the team found that humans and robots can collaborate effectively in a similar team setting where the humans used smart phones equipped with software agents, in the form of smart phones, to participate in the trading system. The next phase of Dr. Dias’ work will involve bringing these findings into a real-world setting. Dr. Dias said her research team is open to input from the disaster-response community. The team started the project with a review of all the research and information available on the use of robotic technology in disasters. “We looked at the recent earthquake disaster in Japan involving the nuclear plant as an example,” Dr. Dias said. “We learned a lot about the different needs during that kind of emergency. Dr. Dias’ work spans many sub-fields of robotics. She leads three research labs: the rCommerce lab, which she co-founded and which focuses on planning and coordination research for teams of robots; the TechBridgeWorld research group, which she founded and directs, and which avails technology to underserved communities throughout the world, and the Qri8 robotics lab in Qatar, which she co-founded, to create innovative robotic and computing solutions that impact industry, community, and education in Qatar.